Celebrate EuroJackpot’s one year anniversary by participating in this Friday’s €45 million draw! Submit your EuroJackpot numbers into the next draw to receive your share of one of 12 prize divisions. The results for this new Euro Lotto are published each Friday after the lottery is drawn! You can also check out the results for Europe’s other premier lottery, EuroMillions, right here. The EuroJackpot is a new premier lottery offered by eight European countries. The lotto offers high jackpots, impressive odds and 12 different winning categories. The formation of the EuroJackpot originally took place in 2011, when European national lottery officials met at a Summit in Amsterdam to consider the creation of an additional European Lottery. The original collaborating countries were that of Germany, Finland, Denmark, Slovenia, Italy and the Netherlands, although Estonia and Spain joined later after successful negotiations. While these countries started the EuroJackpot, they have also extended an invitation to allow other European nations to join. The first EuroJackpot draw was held on March 23rd of 2012 in Helsinki, Finland. To play the EuroJackpot lotto, players first select five numbers from a guess range of 1-50 as well as two additional numbers from a separate guess range of 1-8. The additional numbers allow lottery players the possibility of winning supplementary prizes and are also essential to complete the jackpot winning numbers selection. Players can pick their numbers manually (Natural Selection), use their pre-selected numbers (My Numbers), or have their numbers randomly chosen (Quick Pick). Additionally, players can enter lotteries in advance by purchasing a Multi-Draw ticket, or choose a Subscription to ensure they never miss a draw. Both methods also reduce the cost of playing. Online lotto ticket purchases close 3 hours prior to the drawings, which occur every Friday evening at 17:00 GMT in Helsinki, Finland. EuroJackpot results are posted on theLotter after the Friday draw, and EuroMillions winning lotto numbers are posted after each Tuesday and Friday draw. The EuroJackpot offers 12 different winning categories and to win a share of the top prize, players must correctly guess five regular numbers and both additional numbers. The EuroJackpot has a tax-free jackpot starting from €10 million and the potential to rollover. 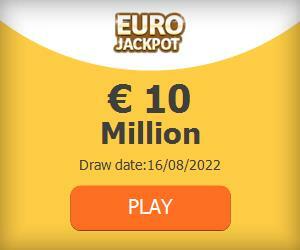 If no one claims the jackpot, it will continue to grow until hitting its cap of €90 million. To claim the main prize, winners are required to submit the winning ticket in person at the EuroJackpot headquarters in Germany. Players who enjoy Europe’s top lotteries might also enjoy the EuroMillions lottery or Italy’s SuperEnalotto.